Newt Gingrich has now led eleven national straight polls, counting just the latest Gallup tracking, and now covering a span of four weeks. He’s been ahead a month. That’s already four times longer than Herman Cain ever led, and getting close to the span of Rick Perry’s lead, which lasted about five weeks. But is there any sign of weakness? We see a wide range of results in the polls. Even though Gingrich leads them all, the specifics are different in Gallup’s tracker (1000 RVs, moving average), Ipsos for Reuters (443 Republican/Leaning RVs, no mention of mobiles, MoE 4.7), GfK for Associated Press (460 Republican and leaning RVs, MoE about 4.5), Hart/McInturff for NBC News/Wall Street Journal (unspecified number of Republican LVs), and then Pew (392 very likely primary/caucus voters, MoE 6). Of these five polls, Gingrich has a mean lead of 10.6, with mean support of 33 to Romney’s 22.4. But there’s a lot of variance: Gingrich has a range of 12, Romney has a range of 9. Yet Gingrich goes no lower than 28, and Romney goes no higher than 27. So as wild as it looks, I think we can still be pretty confident that Gingrich still has a solid lead. In fact if I run my handy percentage tool on each poll, using the margins of error of each, Gingrich has lead probabilities of 90%, 85%, 74%, 97%, and 87%. Being that these percentages are inherently ratios, we might take the geometric mean of the underdog’s percentages to average these numbers to put Gingrich at 89%. However with five different polls, all giving Gingrich a range strictly above Romney’s range, this is great news for Newt. What about the favorabilities? I’ve long called those the key to reading these polls. I think they matter less with Mitt Romney and New Gingrich, as both are relatively very well known, but I’m not giving them up. Among all adults, the NBC poll puts Gingrich at -16 vs Romney’s -8. Sounds bad, but again this is among all adults, and for Gingrich that’s much better than his -32 in June. That’s a major turnaround. 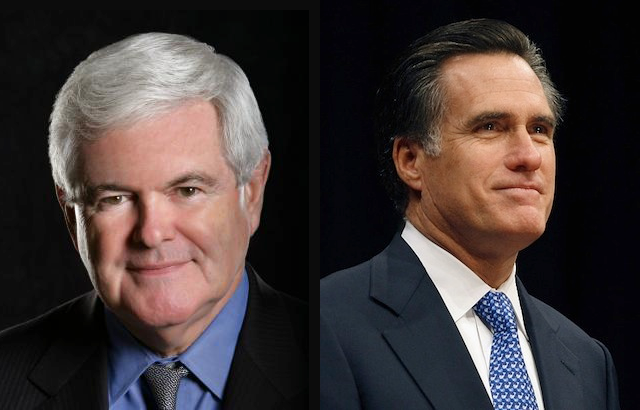 In June Romney was at +1, so Romney’s gone backward by 9 points, while Gingrich has come forward 16 points. Pew didn’t directly ask favorability among Republicans. They did ask whether people had a chance of supporting a given candidate, or no chance at all, no matter what a person’s first choice was. For Newt Gingrich he had 35+35 for 70% who support or had a chance to support him, and 18% (the lowest in the poll) who had no chance to support him. Romney came in second in both categories: 21+40 for a 61% who do or might support him, and 26% who absolutely will not do it. Again we find that outside the Internet, this race never was Romney vs not-Romney. Not when Romney led, not when Perry led, not when Cain led, and not now when Gingrich leads was the Republican base that neatly divided. Opinion leaders maybe, but not the base. By the way, I was asked to watch for a gender gap for Newt Gingrich. Pew showed one. Pew had Gingrich up 40-19 among Republican likely primary voting men, but only up 29-22 among the women. Note that Romney barely changes, so the gap is almost entirely in the level of Gingrich’s support. Are Republican women slower to warm back up to Gingrich? That will remain a question as long as he’s in contention. I am very happy to hear this. I keep ‘stumping’ for Newt againest a horde of naysayers. I am a Newt/Perry person all the way!